Allons au delà! is a brand new literature anthology designed to prepare students for the new AP® French Examination coming in Spring 2012. This highly anticipated program provides thorough coverage of the Themes, Recommended Contexts, Essential Questions and Learning Objectives as outlined in the College Board Curriculum Framework. Option 1: Student with 7-year license to the Digital Course. Option 2: Online Student Edition (eText) with 7-year license to the Digital Course. In this option, students do not receive a print Student Edition; rather, students access the textbook online through the eText. Option 3: Online Student Edition (eText) with 7-year license to the Digital Course. In this option, students do not receive a print Student Edition; rather, students access the textbook online through the eText. Your Complete AP® French solution from Pearson! Purchase both AP French: Preparing for the Language Culture Exam<> and Allons au delà! 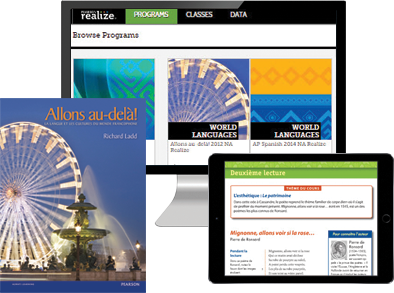 Students can work with both Digital Courses within their AP®/Upper Level French class! Teacher can use the resources in both Digital Courses to provide the best preparation for the Examination!